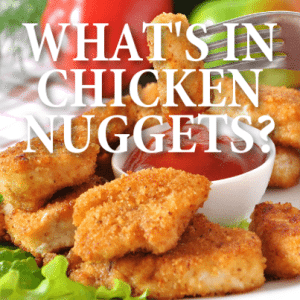 Drs: Shocking Processed Food Ingredients + What's In Chicken Nuggets? Drs: Shocking Processed Food Ingredients + What’s In Chicken Nuggets? On The Doctors, Dr. Travis Stork asked, “Just because it tastes good, should you eat it?” He pulled out a hot dog bun with condiments, and then revealed what you could be eating the next time you eat your next hot dog. He said an artist is raising awareness about what is really in the foods we are eating. So what exactly is in a hot dog? A lot of stuff! And it’s estimated that Americans eat 20 billion a hot dogs per year, or 70 a person. People in Los Angeles consume more hot dogs than anywhere else in the U.S.
Dr. Stork said he likes the idea of showing people what they are actually eating. Dr. Drew Ordon explained that you do have a choice when it comes to what you eat and even certain hot dogs, like kosher hot dogs are prepared a certain way. He said he has switched to chicken or turkey dogs. Dr. Stork said nitrate-free is another key element in hot dogs. Dr. Jennifer Ashton said she believes the point is that food should resemble its natural form, and when they don’t, that’s when you have to start filling in the blanks. Dr. Stork said you should read the labels and know that the more preservatives there are in your food, the worse it is for you. The Drs TV: What Are Chicken Nuggets Made Of? As for chicken nuggets, when you’re going through the drive thru to get your kids some simple nuggets, you’re actually feeding them the animal’s gristle and blood vessels, more so than actual meat. She said at the end of the day, when studies were done at two popular restaurants, only about 50% of their chicken nuggets were actual meat and all the rest of it was something else. Plus, they’re using a lot of preservatives in the food products. Dr. Drew Ordon then asked who likes to pack a nice ham sandwich in their lunch bag and even Dr. Stork raised his hand. It turns out you could actually be eating pig’s feet. Dr. Ordon said when it comes to processed ham, there are two types. There is formed processed ham, where they take the pig leg and scrape off all the meat and muscle, grind it up, put it through a system of fine needles that are injecting preservatives, water, nitrates, salt, and sugar, and then they put it in a big mixing bowl that causes it to become sticky. Then, they actually cook it, and you’re left with lunch meat. The second type of processed ham is called reformed lunch meat, which is what’s left at the bottom of the mixing bowl. Dr. Ordon said you have choices when it comes to making sandwiches, and not everyone can do it, but you can bake your own ham and slice it to know what you’re getting. Other alternatives include a vegan sandwich. Dr. Stork said he’s not encouraging people to give up their chicken nuggets or ham sandwiches, but instead wanting them to go with the least processed, healthiest versions of the food. He said it always helps to know where your meat is coming from, and if you can’t pronounce a bunch of ingredients in the product, it may not be the best thing to eat.